The first sunset set the tone for the week. I’ve been lucky enough to see dozens of them at sea, in some of the most beautiful places in the world, but that first evening anchored in Belize was nothing short of surreal. 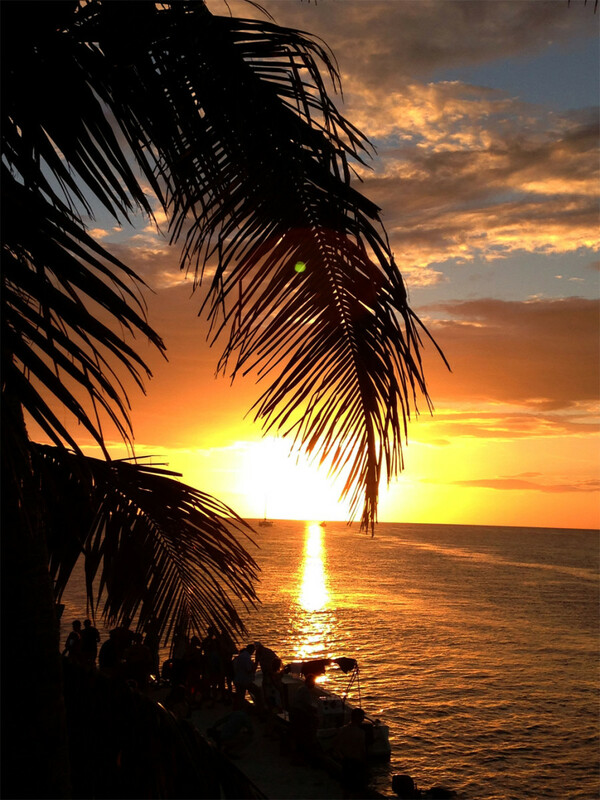 The sky turned blood-orange red, and the line of palm-topped cayes to the west seemed to float above the sea, golden rays piercing the palm fronds and turning the water a dappled pink. In one way, the sunsets were the highlight of our week in terms of natural beauty. 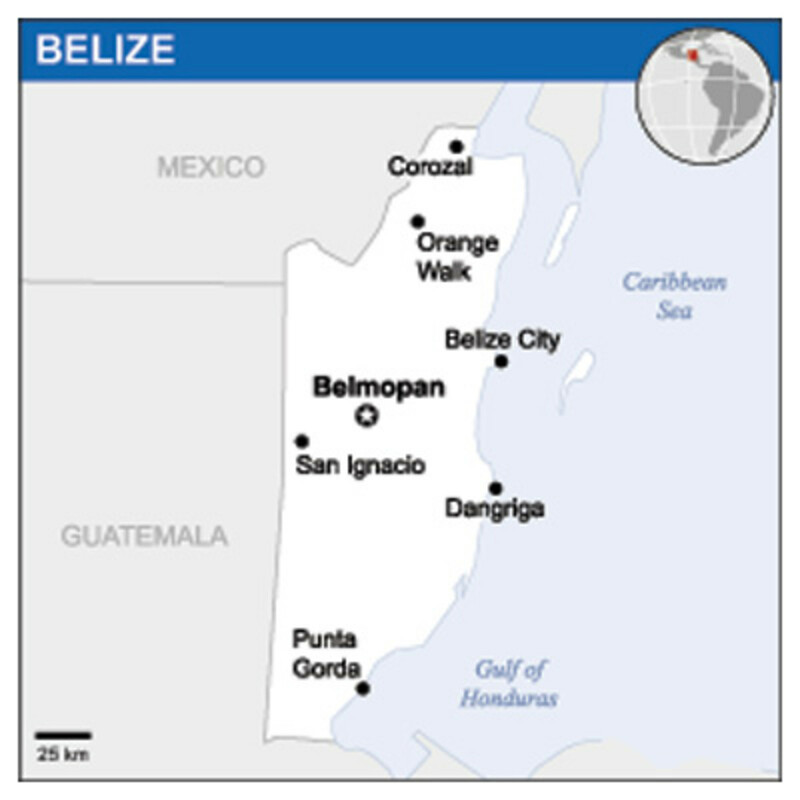 Belize’s barrier reef, the longest in the northern hemisphere, is best appreciated when seen from air, where a breathtaking palette of greens and blues and browns dotted with the tiny islands known as cayes spread out beneath you like an aquatic magic carpet. From the deck of our charter catamaran, all we could see was the sparkling water and the dark blobs of the cayes, many no more than sand spits, some capable of housing small villages, others merely ambitious mangrove clusters digging their roots into sand-and-coral outcrops. You soon learn the rules of tropic-water sailing here. Go west in the mornings, with the sun high and behind you so you can pick out the water colors that indicate depth. In the afternoons, head east, away from the shoreline where distant mountains thrust jagged peaks skyward. In the evenings, make sure you are anchored snugly in the lee of a caye, watching the easterly trade wind ruffle the palm trees while you sip your sundowner. Holding can be poor here, where sand is often spread thinly over densely packed coral rock. As we found out on several occasions, two anchors are better than one. For this and other reasons, chartering in Belize is not for greenhorns. There are few navigation aids, and the charts in the cruising guide are hand-drawn. Pilotage is line-of-sight, always with an eye on the water color. Your electronic charts won’t do you any good here. Although we never touched bottom with our cat, which drew 4ft, we came awfully close a few times. Keep your wits about you, and you’ll be well rewarded. We sailed out of Placencia in the south, a charming little town that makes a perfect spring board for excursions to the Mayan ruins in the interior and to the nearby rainforest where troops of howler monkeys hoot and holler in the treetops and alligators sunbathe on the riverbanks. Further north, the bigger islands and cayes are busier, though still far from crowded. And you’ll enjoy perfect sunsets from any one of them.